Why choose MycoMedica medicinal mushrooms? Google ‘medicinal mushrooms’ or ‘Reishi’ and a number of companies offering mushrooms will pop-up. The products will vary in price, content, origin of ingredients, quality, but mainly efficiency. And so the question arises: What to look for when choosing from such a wide range? The following lines will tell you why MycoMedica products are worth noticing and why they’re used by most doctors and traditional Chinese medicine practitioners. The philosophy of our company is simple but clear. We produce and sell high quality, safe products and above all, effective. In order to achieve our vision, we decided to find a supplier for the highest quality raw mushroom material in order to guarantee maximum efficiency and, at the same time, that our products contain no hazardous substances (which is often a problem with medicinal mushrooms, some contain pesticides, heavy metals, etc.). We use mushrooms grown in the Chinese provinces of AnHui, Fujian and Jiangxi, these are areas virtually untouched by industry and civilisation. Pesticides, heavy metals, micro-organisms, fungi, radioactivity, these are the dangers the raw mushroom material must be protected from. More details on growing our high-quality Reishi can be found here in the article ‘Great Expedition for Reishi to China’, to the country which this queen of mushrooms comes from. We have been working with Hawlik, a German company that has worked in the field for over 40 years and is known for its high quality, that is, high-quality mushroom polysaccharides. Note: Hawlik tested a number of mushroom products offered on the market in detail. They didn’t reach most of the declared values, even though they were declared in tests by Chinese suppliers. Before processing, all the raw mushroom material we use to produce our mushroom products is tested in the German independent laboratory Agrolab for more than 500 types of known heavy metals, pesticides and microorganisms that are dangerous for people. We’re able to present these tests on request. We have also extended the tests by testing polycyclic aromatic hydrocarbons (PAHs) that have carcinogenic effects, can affect prenatal development and are also associated with cardiovascular diseases; see here. The final production of MycoMedica products takes place under the strictest hygienic conditions in the Czech Republic. We use ISO 9001/2009, certified HACCP, BIO and IFS quality system for our production. Medicinal mushrooms are used today to treat a variety of serious illnesses, so it’s extremely important to choose the most effective high-quality preparation, proven ingredients with the correct ratio of active substances, which is safe for the organism – not contaminating it with contaminants. some companies use normal starch to process raw mushroom material to achieve higher percentages of polysaccharides. A standard lab won’t recognise the difference. However, this raw material has minimal therapeutic effects, if any. some Chinese companies expose their mushrooms to radioactive radiation which destroys microorganisms to achieve the microbial cleanliness of extracts. We emphasise that MycoMedica products are not irradiated at any stage of production. some Chinese manufacturers don’t respect traditional manufacturing practices. For example, mushroom drying must be slow and, if possible, in the sun. Therefore, it’s important for us to cooperate only with verified growers and processors of raw mushroom material. We don’t use any unverified raw material in MycoMedia products. We’re not just regular manufacturers and retailers. We like medicinal mushrooms, we understand them, and we can use them in therapeutic practice and see their effects every day in our clients. And we’re not alone. Most practitioners and traditional Chinese medicine practitioners use only MycoMedica products in their practice. However, this traditional method requires a large amount of mushrooms to achieve therapeutic effects. Dried mushrooms are ground to a very fine powder. This partially disrupts the chitin envelope and then the body is able to extract active substances from the mushroom. Unfortunately, the powder contains only 0.5–3% polysaccharides. Gentle extraction using hot water breaks the chitin barrier to extract the maximum amount of active substances from mushrooms. 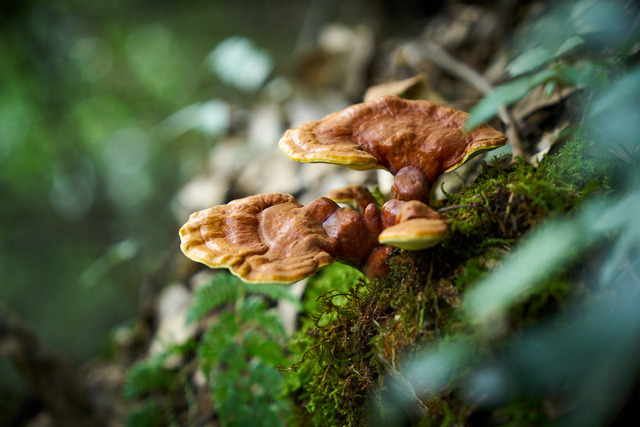 A second extraction using alcohol (the so-called double extraction) is required in case of Reishi and Chaga because some active substances of these mushrooms are water-insoluble. It’s clear from this that the most optimal method of processing mushrooms for medical purposes is extraction. For this reason, the vast majority of medical studies are carried out using extracts, not mushroom powder. The main, but not the only active substances in medicinal mushrooms are polysaccharides (mainly β-(1, 3)-D-glucans). While there is around 0.5‒3% polysaccharides in the dried powder, our extracts contain 30‒50%. Some manufacturers compete with one another and offer extracts with 40‒60% polysaccharides. They say the higher the concentration, the higher the effect. However, it isn’t possible to use this logic for medicinal mushrooms. The proportion of active substances in each mushroom makes it unique and gives its health benefits. Increasing the proportion of polysaccharides at the expense of other active substances actually completely changes the mushroom’s nature. Based on our long-term practice, we have come to the conclusion that the optimal proportion of polysaccharides in the extract should be 30% (40% only in Coriol and 50% in Reishi, in addition to 30%). 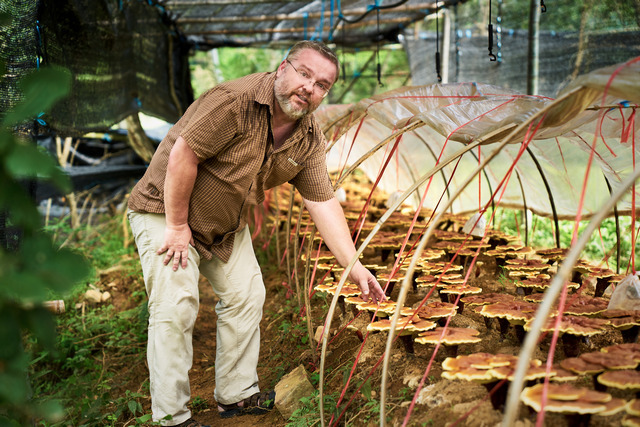 This view isn’t just based on our experience in consulting room but also on the experience of many doctors and Chinese medicine practitioners using medicinal mushrooms as well as on the experience of our German partners from Hawlik, who have been working with mushrooms for over 40 years. They tried using extracts of higher and lower concentrations in practice and eventually decided for 30% because this concentration is simply the best. What happens with a lower concentration of 10‒20%? The product’s effect will be weaker. What happens with a higher concentration of 40, 50, 60% or more? The percentage of polysaccharides in the extract increases but unfortunately, at the expense of other active substances that are also important. This will change the overall effect of the extract compared to a raw mushroom, so the extract will no longer have the same comprehensive effect, which for example, is important in oncological problems. The exception proves the rule; therefore, there are cases that require a stronger impulse for the body – acute conditions, mental or physical exhaustion, cases where it’s necessary to strengthen natural immunity by shock. Therefore, we also offer Reishi with a guaranteed content of at least 50% polysaccharides and 20% β-1.3/1.6 D-glucans (MycoMedica is the only producer in the EU to offer this dynamic combination). Both variants (Reishi 30% and 50%) can be combined in some cases. But for most serious problems, we recommend using Reishi with a 30% polysaccharide concentration. If you’re not sure which product to choose, what dosage you need or whether to choose Reishi with 30% or 50% polysaccharides, please contact our advisory centre: poradna@MycoMedica.cz. If there is a need to increase the effect strength in case of chronic conditions, it isn’t necessary to increase the concentration of polysaccharides in the extract, just increase the daily dose – the number of capsules used (up to 5 g/day). All vendors offer ‘the highest quality, the best ingredients, guaranteed effects, etc.’, arguing that their products have a high percentage of active substances, polysaccharides, triterpenes, fungicides, the longest growing time, various laboratory tests, confusing terms. A lot of this information is just marketing, so how do you know what to choose? Don’t look at the numbers and the word ‘best’. We don’t compete who is the best. Ask doctors and experienced TCM therapists who use mushrooms in their consulting rooms!Logically, they have to work with products that are high quality and effective. Even the best marketing won’t cure their patients. Quality medicinal mushrooms help with cancer, autoimmune diseases, allergies, chronic inflammation, diabetes, hypertension, mental problems, and many others, and only a cured patient is a proof that the product is really effective and helps improve their condition. We are proud of the fact that the MycoMedica mushrooms are used by most doctors, mycotherapists and traditional Chinese medicine practitioners; see here. Regular training – we train other experts in mycotherapy, who can use our mushrooms effectively in their practice. Our training is attended by leading foreign experts on this issue. We don’t underestimate our motto ‘QUALITY – SAFETY – EFFICIENCY’. Thanks to this, we have gradually become the most important Eastern European producer of medicinal mushroom products. We believe that our high-quality medicinal mushrooms will help you.